The mid-range MC027X Master Twister is an ingenious metal twisting machine that enables you to add that subtle twist to your ornamental wrought ironwork. 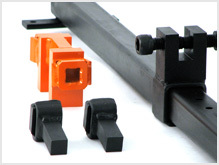 Thanks to the clever clamp and sliding carriage arrangement it guarantees consistent and even spaced twists in flat and square bars making it an invaluable steel picket twister for those struggling to make decorative twisted wrought iron bars particularly for fencing, gates and ballustrades. This highly effective wrought iron twisting machine is also supplied with additional components to grip the ends of clusters of welded bars that can be twisted into rope bar but then when the bar is twisted back in the opposite direction a slender decorative basket is formed as shown in the video clip here. Produces slender decorative baskets to fit 12mm and 16mm bars. 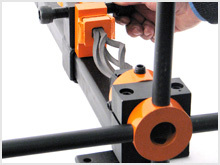 Tool still operates as the MC027 Master Twister but fitted with these special collars for holding and forming baskets out of pre-welded square or round bar clusters (two sizes). By twisting the cluster in one direction and then back the other way, cluster opens out into a slender basket.